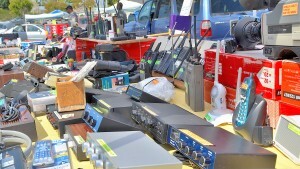 In March, the W6TRW Amateur Radio Club learned that we will no longer be able to hold our monthly Swap Meet at its current location at Northrop Grumman in Redondo Beach. At the March and April Swap Meets we posted and handed out flyers informing everyone of the changes coming and what our plans are. A copy of the flyer can be found here. First, the Swap Meet will continue as usual at Northrop Grumman through August 2015. That’s the plan anyway. Things can always change but, as far as we know, we are good through August. So, plan to come out to the Swap Meet at Northrop Grumman in May, June, July, and August. What happens in September and beyond? I wish I had a solid answer to that question but, as of right now, things are still up in the air. It is our intention to keep holding the Swap Meet every month, just at a different location. Right now, that location has not been decided but we have some irons in the fire. We want to keep it in the South Bay area and that limits our choices since we need a pretty big parking lot to adequately accommodate our sellers and buyers. We are in contact with folks at several venues and are working to ink a long-term contract. The last thing we want to do is move again six months down the road. So we are doing our due diligence to make sure all the pieces of the puzzle fall into place. And that’s really all I can tell you right now because that’s all I know. As soon as we know more, we’ll let you know about it. You can follow us on our web site at w6trw.com, on Twitter at twitter.com/w6trwswapmeet, on Facebook at facebook.com/w6trwswapmeet, or our email list on Yahoo at groups.yahoo.com/w6trwswapmeet. Yeah, we’re going all social media on you. We’ve been holding a monthly Swap Meet for almost 40 years and plan to keep going for another 40. We can’t do it without your support and we really thank you for making the Swap Meet what it is – the biggest Ham Radio event in Southern California. The world famous W6TRW Swap Meet! Come out out to the next one on May 30th.